During the training you will have an intro to Ayurveda, the sister Science to Yoga. 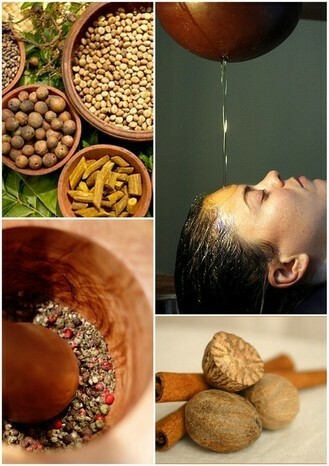 What better way to learn about the ancient vedic medicine by trying an Ayurveda treatment in India! There are plenty of services to choose from based on individual needs. Our favorite is Shirodhara, a blissful experience that is sure to whisk you away from life’s tensions! Shirodhara is a simple, yet profound treatment that works specifically on balancing and stabilizing the activity of the mind. Warm, dosha specific oils and herbs are beautifully streamed over the Ajna Chakra or third eye taking the participant on a journey deep within. Shirodara is highly effective in normalizing sleep cycles, and reduces insomnia. This warm herbal oil massage is a combination of choreographed strokes and intuitive movements that are designed to bring nourishment to the tissues, deep relaxation to the muscles and calmness to the mind. Because each body type is unique, the oil combinations are blended with specific herbs or essential oils to meet your special needs. At Monte Vista, we have created a signature massage for our guests that blends the best of Ayurvedic and Thai massage to create a one of a kind massage experience. Treat yourself with the luxurious experience of this gentle massage using the most healing oils you can imagine. Our Ayurvedic oils, imported from India, are infused with 33 different powerful medicinal and healing herbs from the sacred trees and flowers of India. During the massage the oils deeply penetrate your skin and allow the herbs to cleanse and detox your tissues. Your skin will become supple, soft and satiny. Your all over feeling will be one of deep relaxation and rejuvenation. At Monte Vista we have developed an Ayurvedic massage that blends the lymph activating Thai Massage with the stimulating Ayurvedic strokes that make this massage one of a kind. Pancha Karma is the Ayurvedic art of detoxification, purification and rejuvenation. It is an extremely effective and powerful way to address the root cause of disease and has been used for thousands fo years as a method for staying healthy, young and vital.